I had promised myself that one day I would make a dish with fresh truffles. 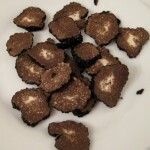 Last week I managed to get hold of the last of this season’s Black Summer Truffles (Tuber Aestivum) from Italy. These delicious truffles have a season from May to August which varies according to the weather, so there is no guarantee how long the season will last. 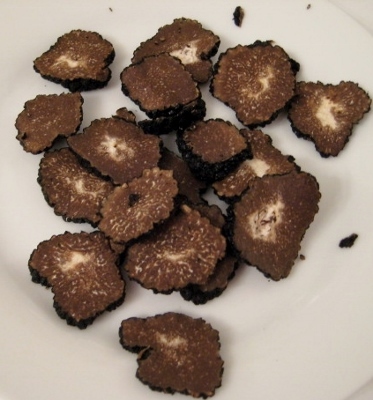 We only import the truffles as required as they have a short life, we keep them wrapped in absorbent paper, inside a sealed container otherwise the entire contents of the fridge take on the aroma. 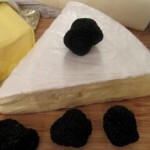 These summer truffles weigh 30g and upwards and look as dark as coal on the outside. The inside is dark brown with white veins. Whilst they have a more delicate aroma than the winter truffles, these fresh truffles still smell incredible. 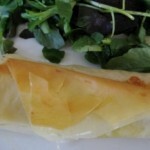 I decided to stuff a delicate Brie with slices of truffles, then bake it in phyllo pastry (a first time for me). Luckily my daughter could give me good advice as to handling the phyllo which is so fragile. The secret is to brush each layer with melted butter. The end result was absolutely sensational and the fragrance quite addictive. 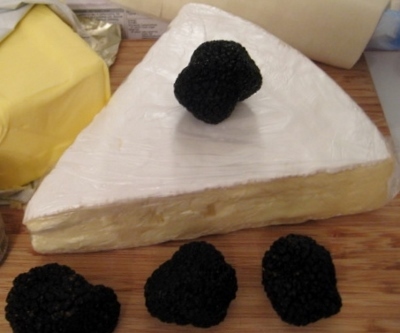 The aroma of the truffle paired perfectly with the slight mushroom aroma of Brie. We tried pairing with different wines, whilst a Petit Verdot had a truffle nose we decided that the best wine was a wild Chenin. I recommend pairing with the Vincent Careme Chenin brut, an organic sparkling wine from Vouvray in the Loire. Brush off any dirt from the truffles. Put in the fridge to cool while preparing the pastry. 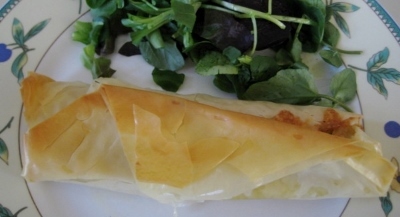 If you are using wedges of Brie then cut the pastry so there is sufficient to wrap around and seal the Brie wedge like a parcel, withloose end of pastry on top. Remove from oven and serve straight away or the baked dish can stand until needed. Just reheat carefully prior to serving. Serve with a baby leaf salad dressed in a light vinaigrette made from olive oil, a touch vinegar salt and pepper.